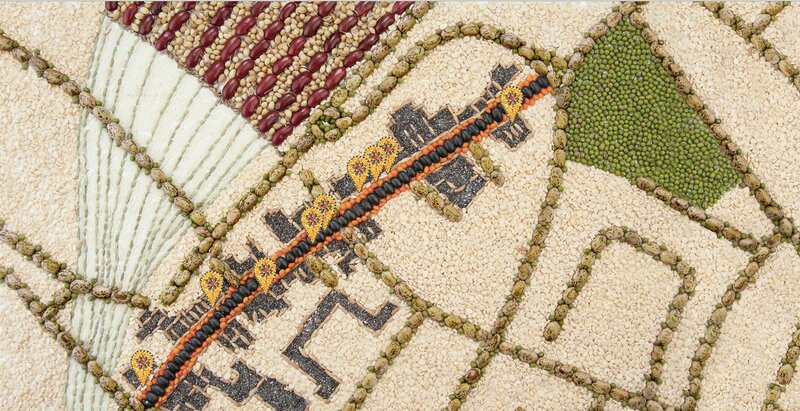 The map at the heart of Food4Thought, the MultiWalk by artist Ali Zaidi. Image B) Ali Zaidi. motiroti was incorporated in 1996 to give a framework to support the artistic projects of Keith Khan and Ali Zaidi, and their collaborators, which had been underway since the late 1980s. The company has been through several cycles of major change over the years, but the idea that has connected motiroti's notably diverse outputs across the decades - performances, carnival processions, installations, digital artworks, and a particularly groundbreaking attitude to cultural participation b was, and remains, migration. Of people, yes; but also of ideas, traditions, foodstuffs, wildlife and a boundless number of other energies in the constantly shifting, never-finished reality that we all share. In spring 2013 we launched our multipliCities programme, which has been developed from our understanding that the biggest (and probably) the last wave of human migration that the species will see is well underway - and it's rural to urban. The city - particularly the rapidly formed "Arrival City" so compellingly defined by Doug Saunders in his book of the same name - is increasingly, and fundamentally, shaped by the ways in which it supports the process of connecting the migrating rural poor into new urban opportunity. Saunders argues that the city is the crucible in which the great opportunities and struggles of the future will be determined. The city is, therefore, a great and critically important location and context for art making - art which, perhaps, needs to step up, and to be supported to do so, given the global scale and impact that migration is predicted to have as a defining force in our 21st century. motiroti develops its artistic programme, therefore, on the basis that the city is, and has to be understood as being, mutable, contested, constantly and increasingly in flux with a multitude of competing voices and ideas; and that migrants play a determining role in the future of humanity. They are emblematic of what we humans are once again in significant numbers, becoming, and this time in a an age of global interdependence. Cities (ancient and future) will be where these roles are played out. motiroti often develops programmes around the existing cultural activities in people's lives (such as our Potluck project, a residency that explores food sharing between cultures and neighbourhoods). Our multipliCities programme, therefore, starts in the streets, and with an everyday action that the vast majority of us engage in every day, typically without conscious thought: walking. In April 2013, in partnership with Cass Business School in London, motiroti produced 'Walking, Journeys and Knowledge', a week of seminars, workshops and artist laboratories, which explored creative urban walking in a broad and interdisciplinary sense. We hosted many exciting and often remarkable discussions and explorations, encompassing walking art, guided tours, mobile technologies, place-making, intercultural activism and a host of other specialisms. We were struck by the energy and enthusiasm among those who came to present to participate, and a sense that in creating an open, inclusive conversational space, interesting creative people from very diverse disciplines - artists, tour guides, software developers, academic researchers, intercultural activists among them - were walking towards us from all directions. It feels like a very contemporary approach to culture making. We captured much of the audio from the conversations during the week and it's available on our website for others who might be interested. the scope for viable creative connections to be made between walking, art and social justice. The first major project to emerge from multipliCities is MultiWalks - a digital mobile platform - an app - that offers intercultural walks of city neighbourhoods. In its first phase - version 1.0 - these cities are European: London, Oslo and Reggio Emilia (in Italy). It's been developed in partnership with Mondinsieme in Italy and with Oslo Intercultural Museum, and has been supported by the European Cultural Foundation and the Arts Council of England. MultiWalks doesn't seek to compete with the blizzard of mobile-enabled city guides that are out there; it's not a strength or interest or our partners. Instead we have sought to place the artistic voice a the heart of the software design process, and develop the platform around, and in response to, the journeys that these artists - most of whom are from migrant backgrounds - want to take us on. There are five walks in MultiWalks 1.0, and our aim is that these will be supplemented and enhanced by contributions from other digital walk creators from around the world in the future. The app is free on iPhone and Android, and the walks can be enjoyed from anywhere in the world; even, we like to say, from your sofa. As we're at the beginning, we've consciously prioritised getting the artists' content in the hands of large and globally distributed audiences. Of course, there are additional rewards to be gained by those who walk these neighbourhoods in reality with the app running, not least a chance to interact with locals and to discover places that don't feature on the 'tourist trail'. And we're thrilled that the five artists, very different from each other in biography and artistic practice, have let their imaginations take them on journeys that extend in very different and distinctive directions: discovering characters, revealing heritage, building community, raising some spiky questions. We believe it will make the digital platform both more robust and more remarkable in the long term, and will allow opportunities to be uncovered in each location to connect the walks, and what they represent, into wider conversations. 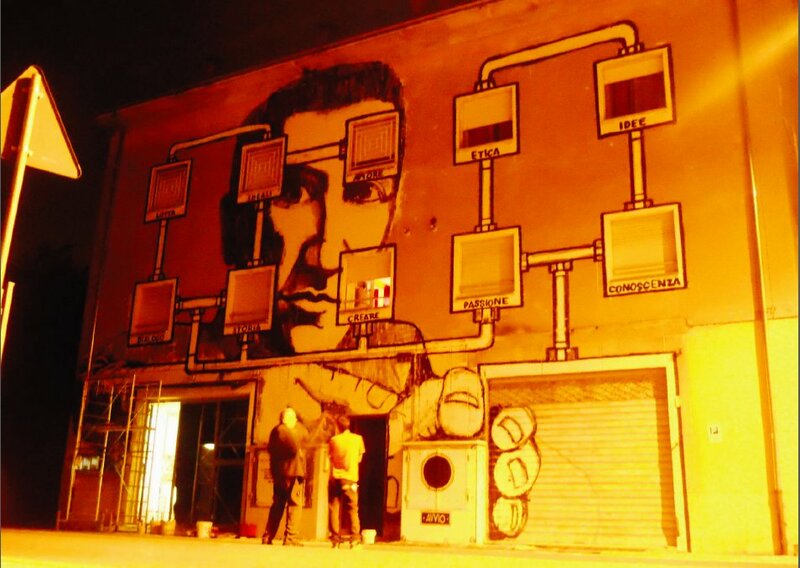 The artists are Ali Zaidi, Gabriel Gbadamosi, Margarida Paiva, Shwan Dler Qaradaki and street art collective CollettivoFX. The characters of the neighbourhoods through which they trace their walks should also be recognised as active agents in the collaborations: Waterloo and Vauxhall in London; GrC8nland and BjC8rvika in Oslo; Santa Croce and Mancansale in Reggio Emilia. The connection between migration and mobile technologies seems to us conceptually clear, and creatively appetising, particularly given the steep uptake in mobile phone usage worldwide - helpfully for us, including in places where motiroti has a track record: India, Pakistan, the Caribbean. As a company we've been fortunate to support the development of some amazing artists who grasp the power of migration, interculturalism and global perspectives in their practice. The imaginations of these individuals can be nomadic, restless; and, as we know increasingly, more and more of us experience real-time international connectivity on a routine, perhaps bizarrely normalised basis. Mainstream usage of digital technologies, handheld or in fixed locations, may be commonplace, yet it also encourages personal reflection on notions of distance, proximity and co-presence (as well as the relative weightings and significances of multiple presences that an individual might have, or maintain, in different locations, and the interplay between them). Given this, and given the clear acquaintance that migrants have with notions of co-presence, we are intrigued by what we perceive as an unrealised opportunity, in the UK thus far, to fully engage with or culturally represent migrant and minority ethnic community viewpoints within digital mobile art making. This is a territory motiroti seeks to be active in; and one, from our initial reconnaissance, to have pathways that also connect to other sectors - urban development, regeneration, placemaking and tourism - vital at a time when we recognise that arts and cultural organisations need to enterprise. MultiWalks 1.0 enables artists to deploy familiar media: video, imagery, audio, text, and (for those physically present in a featured neighbourhood) GPS enablement on one of a collection of unique and dynamic artistic maps which sit at the heart of each walk. For all this, I expect MultiWalks may best be understood as a platform for storytelling, enabling the circulation of what our Italian partners Mondinsieme refer to as untapped 'narrative capital' from the communities that live, work and visit these neighbourhoods - which we and partners have typically identified according to their scope for intercultural activity. They may be neighbourhoods proportionately more likely to have a high density of migrant populations, perhaps established very recently (such as Santa Croce in Reggio Emilia) or in some cases stretching back to the 1950s - such as Vauxhall. (This is not to deny that, as our Streets of Gold project highlighted, the history of London, for instance, is built on centuries of migration.) Intercultural neighbourhoods contain high potential - creatively, socially, economically - precisely because of their migration dynamics: the historical physical mobility of significant sections of their citizenry in turn creates energy for social and material advancement. Passed down the generations, there is a mobility sustained in the collective mind and heart, co-present and hybridising between cultures and continents, that constantly shapes the negotiation of daily realities. As far as the tools and technologies will allow, we seek to reflect these complex dialectics of mobility within the MultiWalks content and framework: to put the user/audience in mindfulness of being present physically in the street where they are, but also for their imagination to simultaneously wander the streets of an intercultural neighbourhood elsewhere in the world. A neighbourhood, that despite clear differences in terms of histories, populations, and cultures, might feature some notable commonalities in its placing and relationship to the wider city of which it is a part. And ultimately, perhaps we seek to understand these neighbourhoods as a prism through which the public can appreciate entire cities, with an understanding that the meanings of a city are themselves mobile, potentially contradictory and never resolved. As we know, the process of recognising something as valued 'heritage' has an inbuilt reflex which can simplify, reduce, prioritise dominant stories and singular meanings. Which, essentially, can ossify: witness the scores of frozen-in-time statues in central London, and the care taken to craft in stone b by the height of a plinth, perhaps, or the symbolism of a shield or animal b the messages that those in power wanted to project. But, as the world turns a corner, with more arrival cities, ancient and brand new, evolving around us, it's an opportune moment for these 'crucibles of the future' embrace multiplicities of meaning; and to recognise that they have always contained a multitude of stories. As Jane Jacobs says in 'The Death and Life of Great American Cities': "The point of cities is the multiplicity of choice". Cities that use culture to find compelling, inclusive ways to harness the migrating narratives within their neighbourhoods, will be better placed to guarantee a fair future for all of their increasingly diverse citizens, and in so doing will stand the best chance of renewing their own integrity as the successful cities of the future. MultiWalks can be downloaded for free from the Apple App Store and Google Play, with the artists' walks there for you to enjoy. Come and walk with us, and let us know what you think: info@motiroti.com or twitter @motiroti #multiwalks.